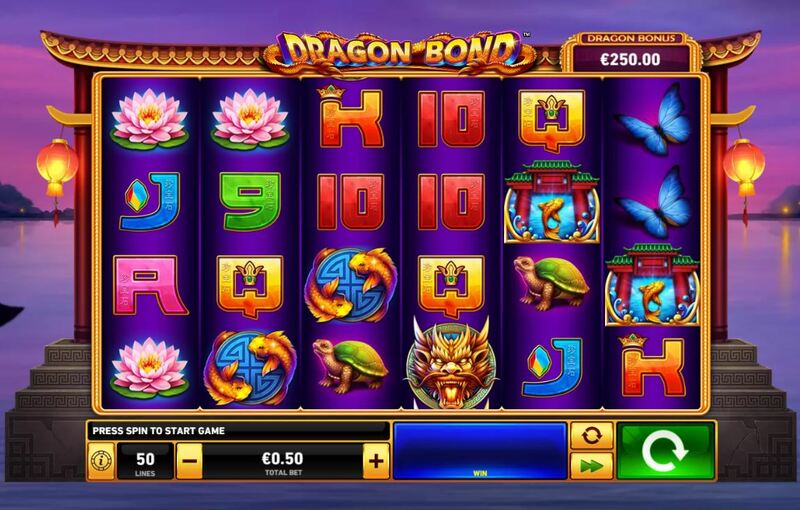 Dragon Bond slot by Playtech gets it's name presumably from the bond between the Dragons which we'll read about subsequently. The theme is yet another oriental one which Playtech seem to make many of lately, with Wu Long, Ways of The Phoenix and Coin! Coin! Coin! being more recent examples. The purple reels are set over a coastal pagoda at night with lanterns reflecting off the calm water and we don't get the typical Chinese music here, rather simple taps when the reels stop and some 1990's Super Mario-style sounds when the wins appear! I just hope these dragons can't break the bond that tends to exist between me and my bankroll though. 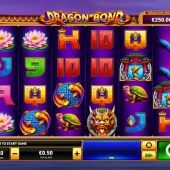 On Dragon Bond slot we have 6 reels of 4 rows each with 50 fixed pay lines and on which we see single and stacked symbols except for the scatter. The pays are pretty terrible for the 6-of-a-kind wins the Wild Dragons being highest at 100 coins or 2x bet, Carp 20 coins, Turtle or Frog 15, Lotus Flower or Butterfly 10 with six card values paying an abysmal 5 or 4 coins each. This tells us we have terribly low volatility here, but there is one small hope for redemption. If you see any non-adjacent Wilds land on the same row, all symbols between them on that row turn Wild too. There is a Dragon Bonus which is a payment of 250x bet for a full screen of Wilds. You can see the anticipation spin when you land the full stack of 4 Wilds on reel 1, so if you landed it on reel 6 too the whole grid would form bonds along the rows to give you that astronomic top pay! Temple scatters appear on all reels and you need them consecutively from the first reel. You are awarded 10 free spins for 3, 15 for 4, 25 for 5 and 50 for all 6. You can retrigger them and the game rules don't even specify any enhancements such as multipliers but I seem to notice more Wilds appearing so maybe the reels are slightly different.